President Duterte is ready to declare war on China or any other country over Philippine sovereignty in the South China Sea, his Foreign Secretary has said. Alan Peter Cayetano used the term “West Philippine Sea”, to denote those waters that are within the country’s 370-kilometre exclusive economic zone. Cayetano gave assurance of the president’s readiness to defend Philippine sovereignty before an audience of Department of Foreign Affairs (DFA) officials yesterday (Monday, May 28). “The president has said that. If anyone gets the natural resources in the West Philippine Sea, he will go to war. “He said, ‘Bahala na’ [what will be, will be]. 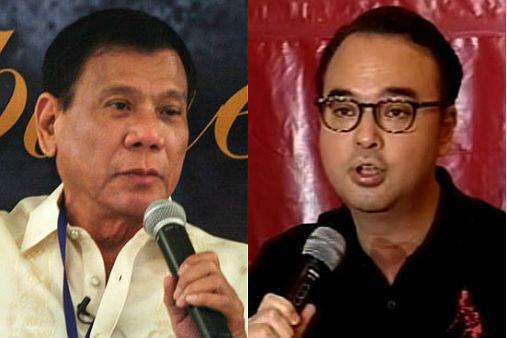 But he will go to war,” Cayetano said. Cayetano’s remarks apparently contradict the president’s prior statements that he preferred to maintain friendship with China rather than engage it in a war over the two countries’ territorial disputes. Addressing the 120th anniversary of the Philippine Navy on May 22, the president reiterated that he would not go to a war he could not win. “Whether you accept it or not, that’s the reality on the ground,” he said. However, Cayetano said the president, who has been criticised for his refusal to confront China with the Philippines’ 2016 victory at the Hague Tribunal, had warned that he would go to war with Beijing if it broke his “red lines” relating to the South China Sea. The first red line, he said, was for Beijing not to build anything on Panatag Shoal [Scarborough Shoal]. China should also not attempt to remove the BRP Sierra Madre from Ayungin [Second Thomas] Shoal, where the government grounded it in 1999 to mark Philippine territory in the Spratly archipelago, he added. “Our soldiers should not be harassed when they deliver supplies or when they repair the runways,” Cayetano said, referring to the small airstrip on Pag-asa [Thitu], the largest Philippine-occupied island in the Spratlys. “Another red line is that nobody will get natural resources there on their own,” he added. The president has previously spoken about joint exploration for oil and natural gas with China, likening it to “co-ownership”. This drew fire from critics who pointed out that this would be unconstitutional. Cayetano stressed that the administration’s decision to downplay the dispute did not mean it was not doing anything to defend the country’s sovereignty. “Even the President himself told President Xi Jinping, ‘That is ours. The West Philippine Sea is ours. We want to start digging for oil and gas in the South China Sea’. How much stronger a statement can that be?” he said. He also vowed to quit his post if it could be proven that the Philippines had lost any territory during the Duterte administration. “I challenge anyone of them, whatever their profession – justice, politician, newsman, journalist – if we lost a single island during Duterte’s time, I will pack my bags, go home. China can take whatever it wants when it wants and yet it’s embraced as the greatest thing since sliced bread. On the other hand I as a humble and obedient servant a(foreigner) paying my dues, taxes, visas and contributing to the economy, can’t even BUY a (small) piece of land. If the Philippines is going to start giving away land why not start here..